Our mission is to provide a safe space for everyone to practice Buddhism. We are committed to providing an inclusive and welcoming environment for all who come to practice. Ocean Gate Zen Center opened its doors in 2007 as a 501(c)3 religious non-profit. We offer a neighborhood Zen Center specifically to address the needs of lay life in the 21st century by sustaining and adopting the centuries old traditions, teachings and practice of Buddhism’s founder Shakyamuni Buddha as interpreted by the Soto Zen Buddhist School. We are in the lineage of Shunryu Suzuki Roshi, who brought his teaching to San Francisco in 1959 and soon after founded the San Francisco Zen Center. Rev. Daijaku Kinst and Rev. Shinshu Roberts trained at San Francisco Zen Center for 17 years and received their teaching certification from Sojun Weitsman Roshi in 2005. 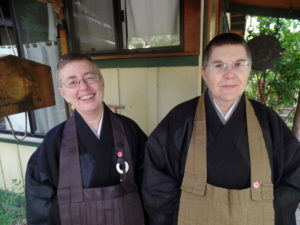 Both Jaku and Shinshu are registered as International Teachers in the Japanese Soto School, and members of the American Zen Teachers Association and the Soto Zen Buddhist Association. For more information about our teachers, please see About Us/Teachers. It is our teacher’s hope that all of us will learn the art of compassion and skillful interaction with self and other through dedication to the Buddha’s Way.